Located at 111-117 Grant Avenue, the Buffalo Hotel was nominated for its architectural significant as a good local example of commercial Italianate architecture and for its association with town founder Charles Jones. 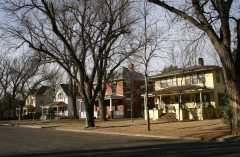 Jones was a driving force behind Garden City's early success and developed the Buffalo Hotel in 1886 to promote the town as a thriving and growing center. 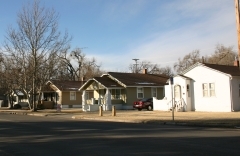 Garden City only had one hotel prior to 1886 - a house that had been converted from the home of William Fulton into the "Garden City Hotel" or "Occidental Hotel." 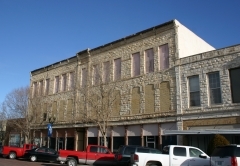 Jones opened an adjacent commercial block in October 1885 and soon thereafter completed the Buffalo Hotel. To design both buildings, Jones hired architects J.H. Stevens and C.L. Thompson of Topeka. 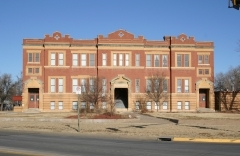 They also designed Carter's stone block, the county courthouse, the Southard Block, and the Stevens Block. 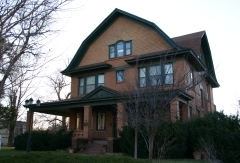 Built in 1909, Cedar Cliff is a large residence that was home to local businessman Edward G. Finnup and his family. Finnup was one of the city's early settlers, arriving in 1879, and his main business interests included land, cattle, and seed industries. He championed the once-despised weed White Blossom Sweet-Clover, and in 1912 became the first person to raise and ship the seed. He was active in Democratic Party politics and was selected twice to serve as a delegate to the party's national convention. He supported William Jennings Bryan, whom he had befriended and hosted during his trips through Garden City, in his campaigns for the White House. Cedar Cliff is an enormous three-story house reflective of the Colonial Revival style. It is nominated for its architecture and its association with Finnup. 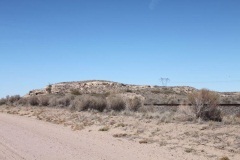 Finney County Point of Rocks is one of at least four similarly named sites along the Santa Fe Trail network that aided travelers in their navigation of the road. The trail passed to the immediate south of this natural rock formation and became the foundation for modern-day Mansfield Road. The site is located on a stretch of the trail that connected the Lower and Upper Arkansas River crossings. The Upper Arkansas River Crossing was the last major opportunity to decide between the Cimarron and Mountain routes; thus, travelers who passed this rock formation included those going to Lower Cimarron Spring via the Upper Arkansas River Crossing and those going to Bent’s Fort in Colorado. Because of its navigational role, Finney County Point of Rocks is nationally significant for its association with transportation and commerce along the trail from 1821 to 1870. 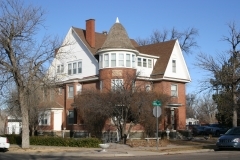 Builder E. F. McCombs constructed this house in 1908 and lived there for a short time before selling it. 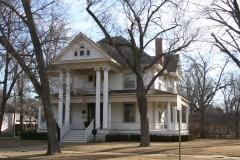 Clifford R. Hope, a Republican congressman from Garden City, purchased the house in 1920. 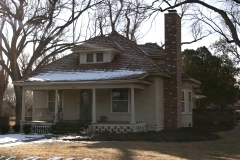 Congressman Hope represented the 7th and 5th districts in the U. S. House of Representatives from March 4, 1927 to January 3, 1957, and he lived in this Craftsman bungalow with his family during his many years in office. His lasting legislative accomplishments were in the areas of soil and water conservation, agricultural research and marketing, and Public Law 480, legislation which provided food distribution to needy countries. Additionally, Hope was an early supporter of soil and water conservation. 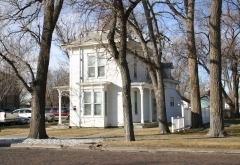 The house was nominated for local significance in the area of architecture and for its association with Clifford R. Hope.